11th Avenue was built over ten years ago. It was built to the NMRA(BR) three track standard. I'm now adding a board to convert it to the new single track standard. It was started when we still used D.C. so has a control panel to switch track power blocks, this is now useful to allow it to assign different boosters to tracks. The right board is the convertor board. At left is a proposed board to allow the module to be a through one. For now it will be a terminus. Overview from the end of the new converter board shot at yesterday's modular meet. The tank farm has gone, replaced by a grain elevator, a much more imposing structure. Once this end is done, a new tower still to be installed, I'm going to rebuild the other end. It will finally have a station building and allow that end to be connected to, so 11th Avenue can be a through module. Wow, dramatic change! Like that a lot. I decided the original industry could only handle a few car loads, I estimate this one can take over 50 covered hoppers. It adds a lot of vertical scenery, the other end will go to a similar height, once again with structures, one advantage of modelling an urban area. We will try and get a load of covered hoppers to visit the granary at this weekend's meeting. Before I add any more to it I'll have to make a transport box, perhaps to go with what will be going on the other end. At least it now firmly fits on the board, with two 8mm bolts, no one is going to knock it over! Mike_R wrote: I decided the original industry could only handle a few car loads, I estimate this one can take over 50 covered hoppers. Fifty? Pray tell, how? Where? All at once? BrianMoore wrote: Fifty? Pray tell, how? Where? All at once? I mean what the industry can contain, the old tanks would probably have taken 2 car loads and the silos another 3, where as the new silos can take all the cars a session can throw at them. Now say 6 cars could be routed there, with 3 held in the yard while the first 3 are unloaded, and it doesn't look daft as that many cars are unloaded into a large industry. I reckon those six cars would fill one silo, six more to go. 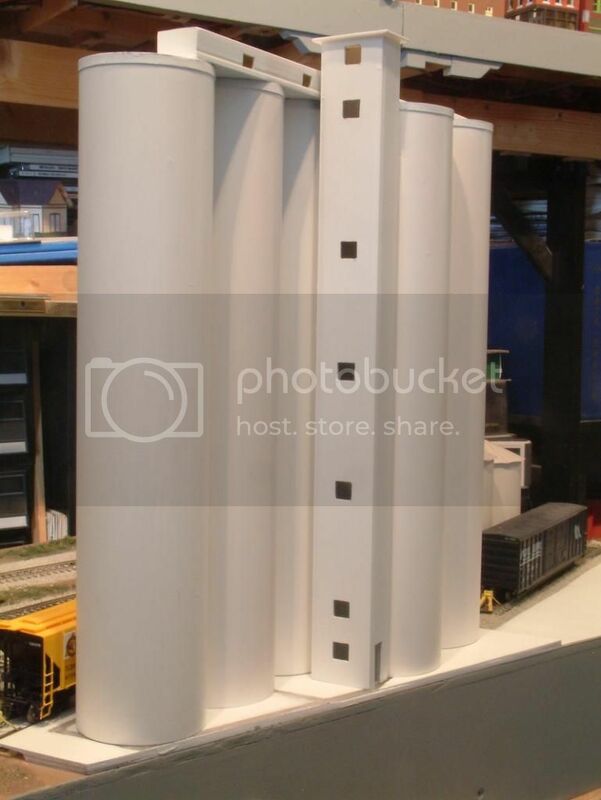 The short silos could be used for three cars of plastic pellets, I might be able to fit taller small silos for more capacity. I will be bringing some covered hoppers to Hilltop this Saturday, Mike! 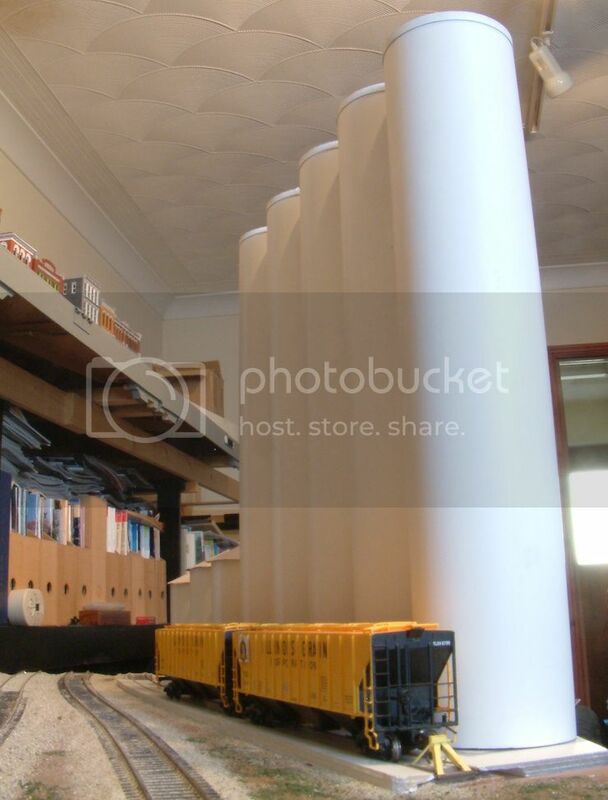 Perhaps we could have bespoke grain trains going to and from the staging to the elevators? After building the grain elevator I needed a way to transport it. I was going to build a box, but that would take up more space, after measuring the space between the boards set for transport I decided it would fit there. The elevator is held down by two 8mm bolts securely fitted to 12mm ply inserts glued into two of the tubes, at least I'll find out next time it moves! These bolts are used to hold it to the transport side. The boards are transported with the side visible at the bottom. 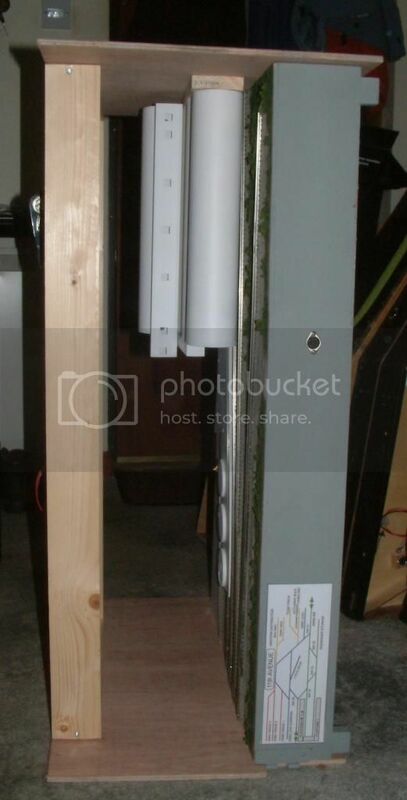 The wood frame at left fills the space where a single 3' module will go. That's a great novel idea Mike, simple and practical too. The only down side is the elevator compromises the future module that will go with this board, I may have to use a different bridge to that planned. Even so the less groups of things to move the better and it fits more in the trailer, freeing up the car. I'll probably put a piece of foam between the elevator and the board, although the way up it travels I don't think they will touch. Once the tower is done at this end I'll move to work on the passenger depot end. Not strictly part of 11th Avenue, as it is a module in it's own right, but this is my latest module. 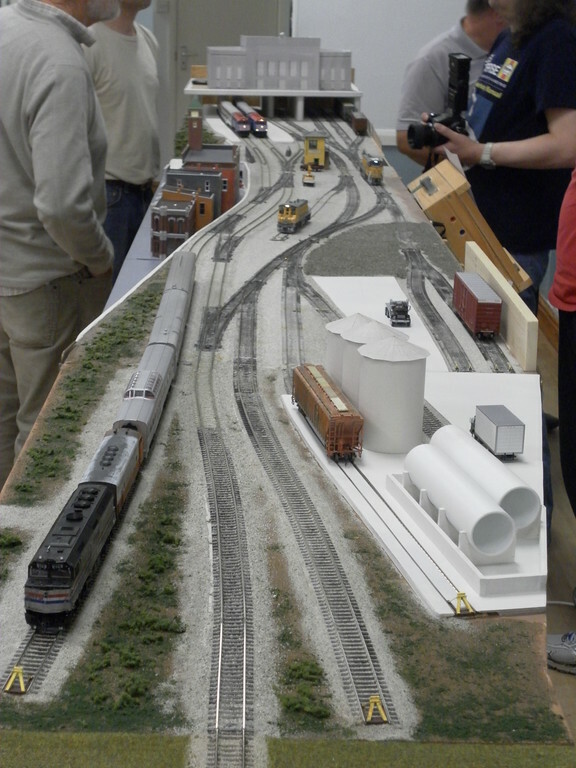 It used to be a double track module and along with three others has been used for over 10 years at our monthly meetings, making up our double track loop. Since changing to the new single track standard they have been out of use. As we build more modules we need corners to fit more modules in the room, so I'm converting one into a single track module. Another may follow. As can be seen on an underside view I have widened the ends to match the 18" width. The wiring has been changed to our standard. I'm not keen on flat earth modules, this one already had the track raised above the baseboard level so I've used that to make a depressed wetland area, with a causeway across the right half of it. Part of the old double trackbed will now become a service road. A grade crossing will be reinstated near the hinge join. 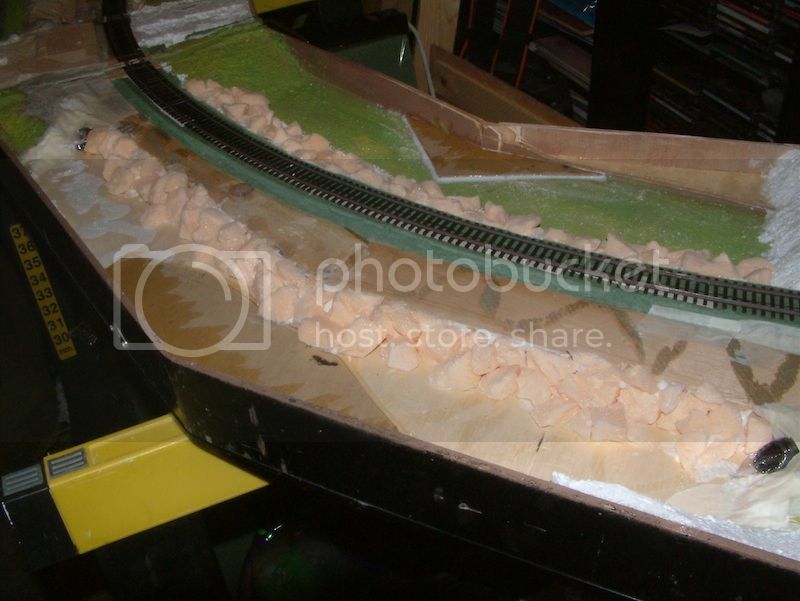 I have strengthened the boards so I can cut the sides down to the scenery level, which should make for good photograph views looking up to the track level. The green areas are the remains of the old scenery. A close up of the causeway part. The rocks are foam. Once the glue and nonails has dried I'll cut down the sides and coat it all with artex. The module still needs legs and will be used at our next meeting, next Saturday. That's looking great Mike. Looking forward to the upcoming meet.